Koolhoven F.K.43 was a small four-seat, single-engined monoplane passenger aircraft manufactured by Koolhoven in the Netherlands. It was a direct successor of the F.K.41. It was a quite successful design with good flying qualities. KLM purchased twelve aircraft and used it as a flying taxi and for pilot training. Two of these where build by Aviolanda. At the outbreak of World War II, four F.K.43s were requisitioned by the Royal Netherlands Air Force. One of these escaped destruction by flying to England, where it was taken into use as a liaison aircraft by the Royal Air Force. 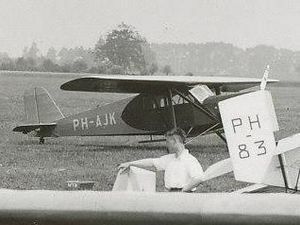 After the war another eight aircraft were manufactured by Fokker (the aircraft were called "Fokhovens"). Only one, heavily modified aircraft has survived until today. It is today located at a museum in Raamsdonkveer.